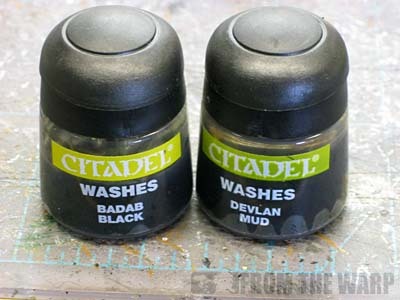 The previous Devlan Mud and Badab Black washes were staples in almost every single painter's tray. Their uses were endless and I'd venture to say that those two washes have helpd more painters improve their work more than any other two colors out there. So what do you do now that they are gone? With GW releasing their new paint line recently, they've replaced the old colors with new "shades" and in doing so, the colors are not the exact same. For most of us, it's no big deal, but for those painters who rely on accurate color matching, the change can be problematic to say the least. The question then becomes, if the new colors aren't the same, what can you do to match the previous colors. And buying as much of the old stuff as you can doesn't count as one day those supplies will be gone. 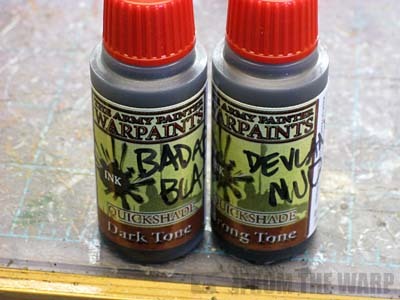 Joel from over at Mordian7th sent me two bottles of Army Painter Ink (Strong Tone and Dark Tone) and told me these would do it. He told me my search for a match to the old washes was done. Since Joel sounded pretty confident and sent me the inks for free, I knew I had to test them out and come up with a honest observation. He's already given them a quick review on his blog, but I wanted to see for myself. It took me a minute to find something I could use and settled on a skull base from Secret Weapon minis. I figured it was big enough and had plenty of texture I could use to compare the washes with. A quick coat of white for the most contrast and it was off to the races. I divided the base into four sections and applied each one to a section. Both of the old GW washes and then the Army Painter Inks next to their counterparts. I'm sold. These are almost exact matches (so close you can't tell) for the previous GW washes. At first I thought the Devlan Mud replacement (Army Painter Strong Tone Ink) was going to be a bit off, but once it dried, it was absolutely spot on. I'd even go so far as to say the Army Painter inks have better flow characteristics than the old washes had. They went over the base nice and smooth without any trouble at all. They had a nice flow into the recessed areas and no pooling in any unwanted areas leaving tide marks. Of course part of that is application, but I was impressed by how smooth they went on. 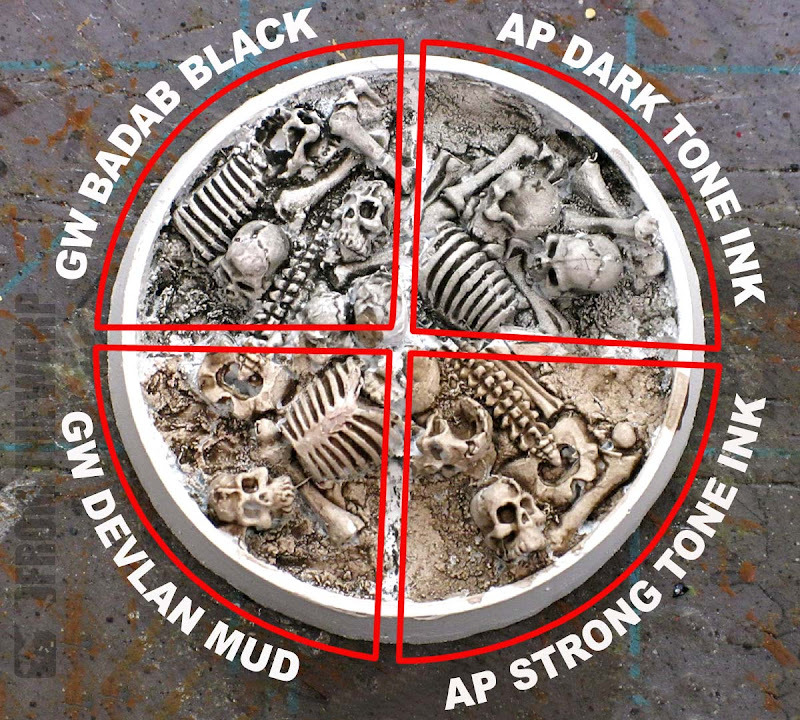 So if you're still missing the old GW Devlan Mud or Badab Black and you wish you still had some, do yourself a favor an pick up these inks. You will not be disappointed in how well they work. Wow, that is nearly spot on. I was initially skeptical, but now I am absolutely convinced. I'm considering switching over to army painter for everything now, I've always had good results with their primers. I'm currently using 'alien purple' for my marines. I've heard they have the best metallics overall also. So with the time it saves, and the value I might just sell off my gw paints and go for broke! Thanks again for reviewing these Ron! Was told this also when the news broke about the new shades coming.. have also just purchased them, and am also getting the same results! Hazzah! Awesome work,I never considered Army Painter stuff as replacements as I was leaning toward the Vallejo washes but wow,I'm sold.Thanks for the article and saving me a headache when I run out. Excellent - I'm glad you like them! I was in a panic as both of those wash colors were integral in my paint scheme prior to the switch, and if I wanted newly painted units to match the old ones I definitely needed a very close match. Phew! I'm going to be trying out several other of the AP washes soon (one the package arrives) and will keep you appraised. Cheers! 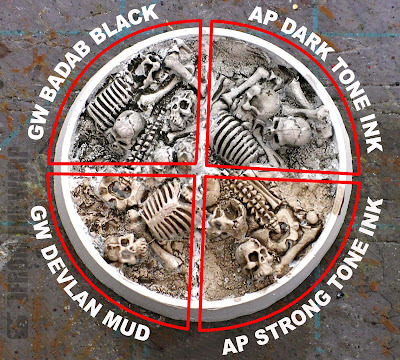 And I take it the new GW stuff is more than just a different colour [ie, different flow and pooling characteristics]? But how do the old washes compare to the new shades using the same method. How do the new shades compare to Army Painter? The new Devlan mud replacement has more red to it like the old Ogre Flesh wash.
@Ron - what about the Vallejo washes? Their Umber wash looks exactly like Devlan...any info? I have started adding Army Painter to my stock of Vallejo paints- eye dropper containers should be a standard. Thanks for sharing this information. My FLGS will let me test colors before buying, but, I prefer to avoid that if at all possible. I have quite a storage of both washes and won't run out for some time, however, its good to know that there are alternatives available to me when the inevitable occurs. Glad it helps guys. Credit goes to Mordian7th for passing this along to me. Marshal Wilhelm: I know AP has other colors, but I'm not sure what they match up against. And as far as the new GW shades, I like they way they flow, it's just that the colors are slightly different from the old washes they are replacing. davedowns: The old washes and the new shades are similar I've found in their flow characteristics. The shades seem to be slightly better. The biggest issue is the color shift from the old GW washes to the new GW shades. Now I'm not talking about any of the Glazes here, just the shades. I think the biggest thing for folks is the change in colors. As far as the new shades and the Army Painter line, I did not match them up since this test was to see if the AP stuff could replicate the old GW washes. Magilla Gurilla: I haven't used any of the Vallejo washes myself. I have a color or two (literally) of theirs, and that's it. Gonewild: And that was the big reason for passing this along. Eventually supplies of the old stuff will dwindle away and it's nice to know this is out there so folks can match what they had before. Werner Fernando Oroxon Ramirez: Very true. Thank you. It was only this week that I was attempting to pick up some Devlan Mud (without success - so this has come at just the right time. Awesome thanks for passing this along. I bought 2 spare bottles of each devlan and badab and then heard that the new washes aren't nearly as good. I use both as an airgun application on essentially every single model I paint (which is a lot) so I was really worried! I'll definately add this to my supply. TheAmbit: You should be all set now. Maybe some fine tuning for running the Army Painter stuff through an airbrush, but you should be all set after that. Did you get the floor polish 'shine' from the quickshade inks you tested? I had assumed that the small bottles of quickshade were the same as the larger can. Perhaps I was wrong? Or perhaps a lighter application alleviates the shine & gap filling? Looks like I need to order myself some Army Painter inks. I'm not a huge fan of the new replacements for washes that GW has put out and this will replace them perfectly. I'm sold! Does AP have something to match the old Gryphonne Sepia? Traditionally inks are very high pigment and very usefull for miniature painting but the reason GW stopped producing them was due to the inks not being water proof when dry and could be "smudged" when over handled. i take it the Army Painter inks are water proof when dry? Cornu Mortem: Nope, no shine at all. I used them straight out of the bottle with no thinning either. I don't knnow if these are the same thing as the Quickshade. These say they are "inks" on the bottles. Rodolfo: I'm not sure. These are the only two colors I've tested so far. Gav Conway: I did try and smear them (with some water) once they had time to dry and nothing happened. Another painter sold here, I hope AP has your check in the mail. That picture of the base truly is worth a thousand words. Thanks for the info! 40 Giveaway: Wouldn't that be nice, but I get no money from this. I'm just passing along what what passed along to me. If it helps other painters, why keep it to yourself? Haha, ya I know, I'm just joking. To put it another way, AP couldn't pay money for a more effective endorsement. I really value your posts and opinions (and I know many others do too!) and am very glad you DON'T keep it to yourself. 40K Giveaway: I'm going to see about getting my hands on some more of the AP stuff to see how it compares with some of the other colors/washes out there. You can expect a full report. I just ordered a set of the Army Painter "Inks" last week based on reading about this on another blog. I'm glad to see that your happy with them. I've been trying to make the new GW washes work for my Space Wolves and they just aren't the same at all. Thanks for the review Ron. Cheers! @Rodolfo there is a Gryphonne Sepia match that Stahly tests out that Army Painter calls "Soft Tone Ink". Brainwashed: Thanks for the tip on Gryphonne Sepia and the link to the other review. Psish: Thanks for confirming the Soft Tone Ink or Sepia as well! Awesome! I know my BF will be happy to have a replacement for Devlan Mud. Thanks so much! Sister Lucy: He will be very happy then to get his hands on this stuff. I think it even flows a bit better than the old GW washes did. Just to find were to get some of them! Arkaal: Excellent! You should be able to order them online or maybe pick some up from your FLGS? I've been using the Army Painter "Dark" to replace Badab Black with my Space Wolves and the Army Painter stuff doesn't provide the same contrast on my models that Badab Black did. Is any one else seeing this? I wonder if I should thin the Army Painter Ink a little to try to help with this. Arkaal, Army Painter has their own web store here: http://www.thearmypainter.com/ if you can't find them else where. Brainwashed: Are you using the small bottle as seen in the pic in the post or the big jar of it that can be used to dip models in? I'm using the small bottle as seen in the pic. It's too dark for my metals as well. The Army Painter ink that I have is overall darker than Badab Black when applied the same way as I used to apply Badab. Both on Metals and on the paints. It also seems to pull into the corners and crevices less and react less to capillary action. It seems to keep an even tone all over and tints the entire model rather that increase contrast like Badab Black did. I wonder if I got a bad bottle or if I need to thin mine? Ron, As an experiment try Badab Black and Army Painter Dark Ink on two different Space Marine helmets painted with Adeptus Battle grey or Mechanicus Standard Grey. I wonder if you will see the same behavior I did. Not sure if you have the time/will to do this however. My issue is that I need to find a solution to how I'm going to paint my army as the old Adeptus BattleGrey/Badab Black recipe I had is no longer going to work as I had tested. Brainwashed: You bring up a good issue. I will test it out this weekend to see what I come up with. I'll post my results as soon as I get my findings. I need to retract my earlier statement that the Army Builder wash looked different. I don't know if I was looking at the models in bad lighting or what, but when I went to take a picture the gray's with the Army Builder wash looked identical to the Badab Black model. The model with the Chain sword was painted with the new GW Mechanicus Standard Grey then highlighted with Codex Grey. and the one with the power fist was Adeptus Battlegrey with Badab Black over it highlighted with Codex and Fortress Grey. Brainwashed: Thanks for sharing the links and pics! Nice to see it working over something other than white in a controlled environment. I'm glad it worked out for you in the end. Marshal: Grot droppings... that made me laugh. Glad the post saved you a little bit of money! So I started Imperial Fists and was testing with the GW washes when I found my recipe and then realized that the washes are oop. This guide had me go down to my local game store and I bought all 3 of the Army Painter Inks (Strong, Dark, and Soft tone). The Sepia is dead on when compared to the wash (used it on a helmet glued to a body using the GW wash). I will have pics posted soon but with your test results and my current progress, I can say that I will be sticking with the AP Inks from now on. Thanks for the input! NeoBiggs: Excellent! Glad to hear this little tidbit saved you some serious work. Nice to know what to order in next. btw does Strong Tone stink as horrible as Devlan Mud does :D? You can call me Andy: I don't think so. It's in a bottle dropper so it's not like you open the pot and have to breath it in either. @Morat - It is NOT the same as the big cans of quickshade. It doesnt contain half the stuff that comes in the tin. Remember the dip contains a sort of gloss aswell. Its very similiar to a glossy woodstain IMO. I have (do) use both the tin and the washes, and can confirm the colour match. But its not the same stuff. Having been a painter for nearly 20 years, I love the AP washes (not to keen on the dip) and believe them to be much better than the old GW washes. Could I tell the difference? warpedreality: Glad to hear it worked out. And if I ever get across the pond, I'll take you up on that offer. Serendipity! I just finished a project using Earthshade instead of Devlon and I'm not happy with the results. I'd actually bought the ingredients to make my own Devlon Mud (shudder to think how that would have turned out) but instead, I'm going to grab these products. Thanks for the save. BTW, superb site, superb painting. I'll be back. Monty: These are definitely worth getting it you're a big fan of the old washes. And thanks for the kind words and support! Just ran out of the last bit of Badab Black I had and am running super low on Devlan Mud. I'm totally sold and will be picking both of these washes next trip to the hobby shop.Thanks for the info! Scott: I don't think you'll be disappointed. From the looks of those tests, I think you're right!